In the recent weeks we have witnessed through the media the eruption of the Tonga submarine volcano reaching the oceanic surface. Spectacular images make us feel small in this wonderful planet. The volcano is emerging day after day and, as reported by Associated Press, it is located at 10 km from the main island, Tongatapu, in a cluster of nearly 60 other volcanoes. A few days after after the volcano got protagonism, the media also informed of a relevant earthquake in the area, happened on the March 19th, 2009. A 7.6 magnitude earthquake shaked the conctact between the Pacific, also in the vicinity of Tonga. Well. No. Not really. I mean, yes, it happened, but not in the "vicinity of Tonga". It happened 260 km of the location of the volcano. Anyone with a slight knowledge of geology would think: "Yeah, they are close, relatively, but surely not related at all". This thought didn't pass through the mind of the responsible of choosing the title of the news in the BBC website...: Quake may have caused eruption. Well, why do they choose this title if the video doesn't make any connection between both events? Very few people would have seen the video (hey, it's science, not a celebrity in Cannes), and most of the readers have kept in mind just that: The earthquake and the volcano may be related. It is hardly explainable how an earthquake in such a tectonic framework (an oceanic convergence) can cause, or trigger, or affect a volcano 250-300 km away. Both phenomena are perfectly understandable if we take them independently. So, why the story in the news? Possibly is easier to sell the story like that. I remember how difficult is to explain people how two events can happen at the same time but be absolutely independent: "Sorry, are you saying that the tsunami in Sumatra is not related with global warming? but... surely is related. We destroy our planet! And anyway, you work with satellites, you haven't been in the field". Argh. Anyway, the good news is that there is not any material harm, and general news are talking about geology. Woohoo. During the 80's the explorationists had in their shelves the unique work of A.W. 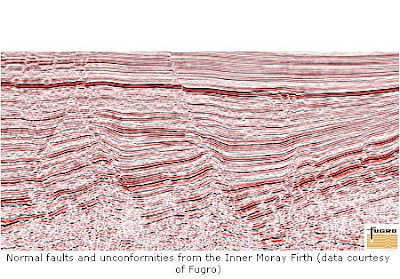 Bally, "The Seismic Expression of Structural Styles", published by AAPG ("AAPG Studies in Geology" series). This atlas presented and explained in several volumes different seismic lines of all around the world and touched all different types of deformation and deposition. But new times mean changes. Geology isn't an exception to this rule, and for a few years we have available online the Virtual Seismic Atlas. The Virtual Seismic Atlas is an independent and free project based in contributions by public and private organisations and companies. It collects paradigmatic examples of seismic in differente regions, tectonic / sedimentary frameworks, deposition environments, etc. It is possible to browse it using different criteria (environment, types of structures, depositional environment and so). The Virtual Seismic Atlas is sponsored by BG Group, Shell, BHP Billiton, StatoilHydro, HESS, NERC and PESGB. 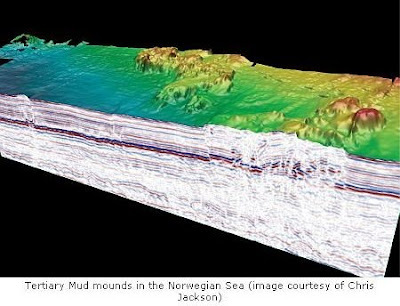 It also counts with the collaboration of British Geological Survey, The Geological Society, CGG Veritas, Fugro, Badley Geoscience and Midland Valley. The project director is Rob Butler, and it is hosted in the servers of the Universidad de Leeds.